All current models from item response theory (IRT) assume the latent trait follows a standard normal distribution. While this assumption is appropriate for traits such as ability or attitude, it creates both conceptual and technical problems traits such as addiction (alcohol, drugs, gambling). The distribution of an addiction trait is better assumed to be anchored at zero (no addiction) and positively skewed. 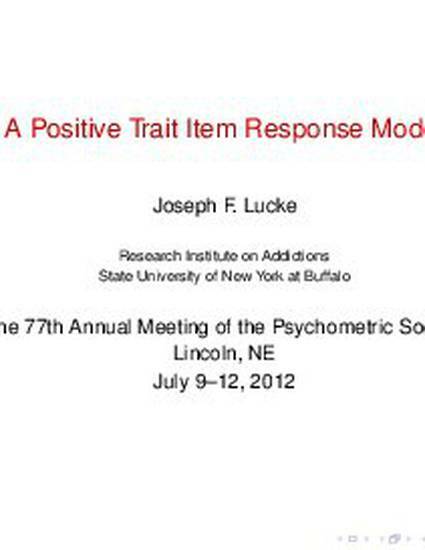 A small change to the usual IRT model yields a class of positive-trait item response models (PTIRMs). I discuss PTIRMs and present one model in detail, including item characteristic curves and item information curves. I present an example using Bayesian MCMC methods. I also connect PTIRMs with Rasch's original item response model and to Stevens's psychophysical power law.